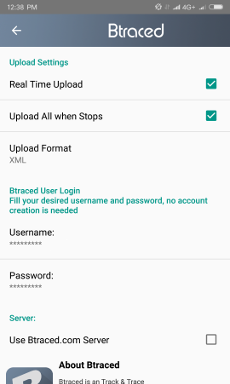 After having installed bTraced tracking app for Android Smartphone you can begin tracking your trips but no one will be saved yet. To keep your tracks history you need to make up some setting in you just installed App. Click Settings Icon on the upper right to get into settings menu. Then click “Upload Settings” link to change server settings. If you already have your own MyWakes account please fill Username and Password fields with your credentials. If you are a new user please fill Username field with your e-mail address and Password field with any password you want (at least 8 alphanumeric characters). Being a new user means that when you will start tracking your account will be automatically created but it will be not fully functional yet. In fact, MyWakes will send you an email to verify your identity. Immediately open the email and click on the link inside (to verify the authenticity of your email). 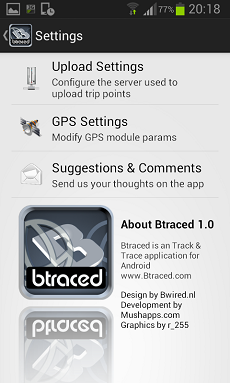 Now you can use bTraced tracking app and keep all your trips on MyWakes tracking platform. After you wrote Username and Password scroll down the pagela and turn off “Use Btraced.com Server” flag. Come back to the previous page by clicking the arrow on top left to save settings and start tracking. To start a new track click “Saved Trips” icon on bottom left and then choose “Create a new trip”. Write a name for your trip (default is starting date and time). Position fixing and data sending will start by activating the “Tracking” command at the top of the tracking dashboard; this will last until the same command is turned off. The dashboard also shows the current position (latitude and longitude), speed, altitude, journey time and distance traveled. 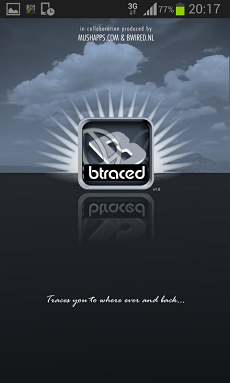 Note: the tracking app may require the use of GPS, it is recommended to give consent to improve accuracy. The “Map” button in dashboard bottom right will show the map with the entire trip (see picture). The bottom left button shows the number of fixed positions and how many of them have been sent, successfully, to MyWakes. 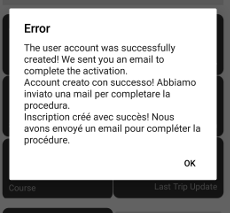 If you see this message this means that your account has been created successfully and you are trying to begin your first trip. As soon as MyWakes receives the first fix, it will send you an e-mail to the address specified in your Username, to verify your identity. You must open the email with the subject “Activate your new account | Attivare la tua registrazione | Activer votre inscription” and click on the link in the body of the email to confirm your identity. 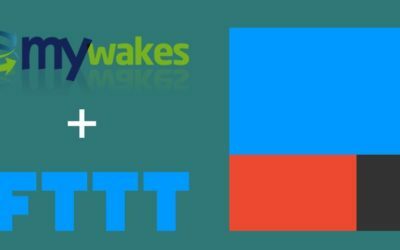 After this verification you can start tracking and sending points to MyWakes. 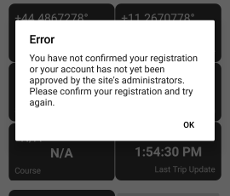 If you are seeing this message it means that you did not clicked the verification link in the body of the mail MyWakes sent to you when you started your first trip. You need to open this mail and follow the instructions in it in order to track your trips. When you track your trip without a data connection (or you are in a place without network coverage) you can continue tracking. 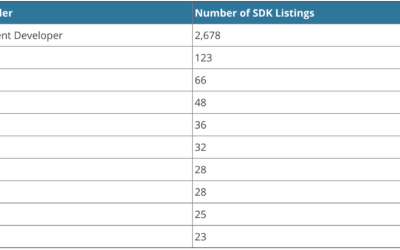 You will see that fixtures will increase while, obviously, the number indicating the locations sent to the server will remain still (for example 0/1520 0%). 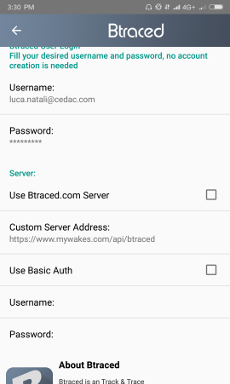 The App will let you to send data to MyWakes at any time, even by using WiFi, simply clicking on the button that shows the number of fixed points: the positions will be uploaded immediately to the server. By clicking “Saved Trips” icon in the bottom left you will see the full list of trips created with the App. By selecting a single trip you will see its detail. 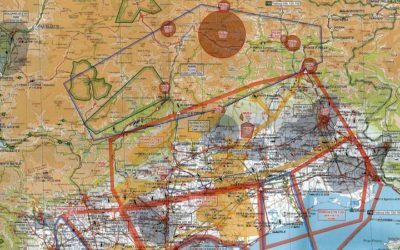 In particular, date and time of departure and arrival, traveled distance and number of surveys (each bTraced “trip” can not have more then 1’000 points so, once this limit has been reached, you must start a new “trip”). Here you can export the track in GPX format, view it on the map or continue the journey (Set trip active). 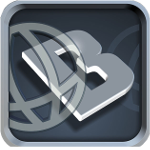 By clicking the upper right icon will be able to share your trip to Facebook or Twitter. The “View” button will display the list of points. Furthermore, by clicking “Upload” the points not yet loaded will be sent to the server. Finally, the “Reset” key will reset to 0 the counter of the points sent so, at the next upload, all points from the start will be sent to the server. From “Settings” icon on the bottom right you can access a series of settings that allow you to optimize your experience of use: the following is an explanation of all the options. Time filter: detects a point every x minutes.